Yes, homes in historic districts in Denver can be modified. Denver's regulations for historic districts are flexible enough to allow for homes to be expanded and updated to meet modern needs and preferences. Click here to see more examples. Interior changes require no review. Major external changes must be done in a way that conforms to local design guidelines. Minor exterior changes (e.g., installing an air-conditioning unit, irrigation system, or satellite dish; placing playground equipment in the yard; installing storm windows, shutters, and security doors) require NO review. You may paint your house anytime, any color - no permit required! External modification: In historic districts, exterior changes to a structure, such as building additions, dormers, or a garage, popping the top, window replacement, new fence construction and adding solar panels, are allowed. They must conform to the design guidelines for the district and undergo review by the City and County of Denver’s Landmark Preservation Commission (LPC). There is no fee for this review, and it is generally a fairly quick process lasting from a few days to a couple of months for substantial projects. The LPC review ensures that changes are complementary to the structure and the character of the historic district. The LPC has an outstanding record of approving projects that meet the contemporary needs of the owners while preserving the historic character of the structure. All changes to a home’s interior may be done without any review by the LPC. Minor exterior changes (e.g., changing the paint color; installing an air-conditioning unit, irrigation system, or satellite dish; placing playground equipment in the yard; installing storm windows, shutters, and security doors) may be done without any review by the LPC. Demolition: Demolition of contributing homes that form part of the district’s historic character is generally not allowed, unless a home is structurally unsound (deemed dangerous to life, health, or property) or in cases of economic hardship. Non-contributing structures (i.e., homes not built in the time period significant for the district) can be demolished through established city processes. New construction: All new residential construction must be reviewed by the LPC to ensure that the scale, placement, and design of the new home will be generally consistent with the character of the historic district. To view Historic Denver’s FAQ about Historic Designation, click here. 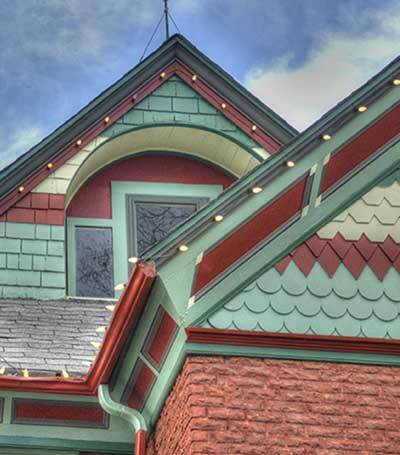 To view the Denver Landmark design guidelines for homes in historic districts, browse this link.